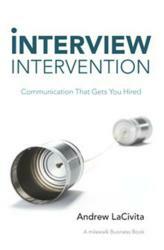 “Interview Intervention: Communication That Gets You Hired” (published by Balboa Press), the first of four planned milewalk business books by Andrew LaCivita, is meant to help job-seekers improve their ability to find and secure the right job and help employers make smart hiring decisions. “Interview Intervention” highlights the three reasons a person actually attains the job –none of which include the job-seeker’s qualifications. This interpersonal communication book – wrapped in a professional self-evaluation and job interview setting – creates awareness of these reasons and prescribes techniques to address them using effective storytelling and question-asking methods. In addition to helping job-seekers, it will benefit those who require significant levels of interpersonal communication to be successful in their professional lives, such as marketers, advertisers, sellers, recruiters, interviewers, speakers, writers, and a host of other professionals. In 2004, after a successful 17-year technology consulting career, Andrew LaCivita created milewalk, a prominent Chicago-based executive search firm. Throughout his consulting and recruiting professions, he has helped over 150 companies improve their business processes, technology infrastructure, and employment resources. He serves as an advisory board member of 7Summits, an agency that helps its clients create and implement social business strategies. He resides in Park Ridge, Illinois. Visit http://www.milewalkbooks.com for more information on “Interview Intervention” and upcoming milewalk business books.